On July 28 there was an incredible event at a two-story house on West Genesee Street in Westvale — 2805 West Genesee, to be exact ... and while I'm being exact, it was called a turnpike in 1935. Luckily the tenants, Mr and Mrs. John Brown, who rented the house from the ownerRay C. Noble of 2904 West Genesee, weren't home. They were in Kings Ferry, visiting her parets. Apparently there was a build-up of gas in the basement which produced an explosion that was like a preview of he space age. The rocket in this case was a hot water tank, which was thrust through the ceiling of the basement, through the ceiling in the first floor and through the roof ... and flew an estimated 250 feet into the air before it came to early in the front yard, about 70 feet from the house. It happened late at night and woke neighbors, one of who called the Solvay fire department, but luckily no fire developed after the detonation. Only a handful of predominantly Republican Central New York villages had enough registered Democrat residents to maintain a two-party system that reflected national politics. Most villages were divided on local issues into parties with names of convenience, such as the Citizens Party or, in one instance, the Square Deal Party. Solvay was an exception; it maintained a two-party system. The village elected a mayor every two years (until 1957 when the four-year term was established), plus a police justice. There are six trustees (councilmen or councilwomen) on the village board, three elected during odd-numbered years, the other three in even-numbered years. Village elections in Onondaga County are held in March. In 1935 the Democrats were in charge. Charles Hall, in office since 1931, was up for re-election for the second time. His opponent was John Degan, a well-known business man who had been active in civic affairs for several years. Hall had benefited from a split in the local Republican party, which wasn't unusual. Democrats, too, often fought among themselves. The difference was that the village had more registered Republicans than it did Democrats. So when the Republicans rallied behind Degan, Hall knew he was in for a battle. Both parties believed in — and often abused — partisanship. During the early 1930s the Democrats sometimes were blatant about it, attempting to discharge village employees who just happened to be Republicans. BUT THE ISSUE that emerged as most important in 1935 was the Hall administration's decision to bond the village for $25,000 to pay for the resurfacing of Milton Avenue, which was a a mess after the removal of tracks that had served trolley cars for many years. The trolleys were replaced by buses. In the meantime, Republican Frank Kinder joined the village board, winning in the third ward over Democrat George Rarick. All the elections were close — Fennelly beat Louis James, 567-544; Olgeaty beat George Grabowski, 463-461, and Kinder beat Rarick, 435-423. Degan then set out to have Milton Avenue not only resurfaced, but widened. So wrote a Syracuse Journal columnist, A. D. Theobald, on April 24, though the newspaper piece may have been misleading. Replacing the trolley tracks, which ran on the north side of the street, automatically widened Milton Avenue, though every photo I have indicates most of this space was then used for parking. Let's put it this way, traveling by way of Milton Avenue was almost always the slow route. Possibility of arson in a fire that destroyed a house at 234 First Street, Solvay, is being investigated by village officials today after the discovery of oil-soaked timbers on the second floor. “It went up like a volcano,” neighbors told Captain Darrow Larkin of the Solvay fire department. The house, a two-family frame building, was vacated by tenants yesterday. Last week a barn in the rear burned to the ground. With a reverberating “boom!” the house burst into flames at 4 a.m. today. Passersby turned in an alarm, but the blaze had such a start that village firefighters had little chance to save anything but the charred walls. In two hours the house was completely burned inside except for a small portion of flooring upstairs. Firemen, going through the ruins, said they found this flooring covered with an coating of oil. Nearby they also found a filled can of oil which the flames did not touch. Mrs. Anna Srogi of 340 Apple Street, Syracuse, was awarded $6,500 by a supreme court jury in her suit against the New York Central Railroad Company for the death of her husband, Walter Srogi. Srogi was killed when a train struck his bakery truck at the Gere’s Lock crossing near Solvay, May 21, 1934. She charged the crossing was not properly protected and the engineer failed to bring the train to a stop when he had an opportunity to do so. The railroad company contended Srogi was guilty of negligence in driving on the tracks ahead of the oncoming train. In March Lowe’s Theater in downtown Syracuse began a series of theme amateur talent shows, the first one open to all people named Smith or related to a Smith family. Two weeks later the magic last name was Miller, which opened the door for Kenneth Norman of 116 Pennock Street, Solvay, who was related to a Miller family. Norman didn't win the show, but his banjo-playing was good enough for third place. Syracuse returned to minor league baseball with the Chiefs, a member of the International League. As an attendance-boosting promotion, the team started a cash giveaway called "Bank Night." The idea proved a bit tricky — and frustrating — because a person didn't have to actually go to a game to have his or her name included among those drawn on any given day (or night) that the team was playing. However, the person whose name was drawn had to be present at the game to claim the prize. And not one of the people whose names were announced was present at any of the first 10 games, which prompted the Syracuse Journal to do a story about the 10 people who were installed as members of what the newspaper called "The Hard Luck Club." How much money these people missed depended on the order in which their names were drawn. The first drawing was worth $200. Since there was no winner, the $200 was added to the next game's pot. Missing out on $1,000 — the prize at game number five — was Edwin Sauda of l05 Lamont Avenue, Solvay, a tailor who was working at the time. He had signed up for the promotion at a bowling alley, probably Solvay Recreation. The newspaper awarded Sauda and other members of "The Hard Luck Club" a season's pass to the Chiefs and the opportunity to sign up again for "Bank Night." Santos Mozo of Solvay High School was given a rating of excellent in the violin section during the second annual New York State band and orchestra competition at Syracuse University on May 11 . . . Arlona Bryers is named valedictorian of the Solvay High School graduating class . . . Betty Snyder, Solvay High School senior, was queen of the 15th annual June Festival at Woods Road Field. More than 1,000 students participated. Today anyone trudging into a field, shotgun in hand, with the intention of shooting anything that flies would risk arrest. The 1930s was a different time. It was more dangerous in those days to go for a walk in the woods or across a country field, especially if you or a companion were carrying a rifle or a shotgun . . . because where there are guns, there often are accidents. On February 22 Bias Armani, 40, of 330 Darrow Avenue, Solvay, took a walk in a field north of Milton Avenue, not far from the Pass & Seymour factory. With him was a nephew, Henry Armani, 17, of 503 Second Street. The elder Armani carried a shotgun or a rifle (this was never made clear) with the intention of doing some hunting, though the Syracuse Journal never mentioned the prey. Out of sight — and in another part of the field — were Edward Kazel, 16, of 111 Boyd Avenue, and Charles Widger, 17, of Center Street, who had set out to shoot starlings at what used to be the Milton A. C. baseball field. Kazel had a 12-gauge shotgun, and decided to test the gun by firing at a sheet of metal, unaware the elder Armani was resting behind it. When the boy fired, several pellets hit Armani's legs. He was taken to St. Joseph Hospital. The wounds, while painful, were not life-threatening. More tragic was the fate of Robert Avery, 14, of 103 Meadow Road, Westvale, who on May 31 was killed when he was accidentally shot while hunting crows in a woods near Fellows Falls in Tully. The shot came from the gun of the boy's friend, Richard A. Pollard, 15, of 123 Terry Road. On January 28 there was a truly regrettable accident at Solvay's Prospect Hose Company that could have been avoided. The firehouse was being used that evening for rehearsal of a play that would benefit the recently chartered Stanley B. Pennock Post of the Veterans of Foreign Wars. The rehearsal was conducted by representative of the Universal Producing Company (not to be confused with Universal Studios). Noise from the rehearsal reached the streets and attracted the attention of neighbors who didn't know what was going on, except that the people inside seemed to be having a good time. Some of the neighbors investigated. Among the curious was James O'Leary, 7, of nearby Caroline Avenue. The boy attempted to enter the building, said his father, Anthony O'Leary, and was rudely greeted by a young woman who worked for Universal. She shooed the boy outside and slammed the door. Unfortunately the boy slipped on the icy, iron plate that covers the threshhold and his hand was in the doorway when the door slammed shut. He lost most of his left middle finger in the incident. A physician asked that a search be made for the missing digit, believing it could be grafted back in place, but it wasn't found. Detective Cornelius Cook of the Syracuse police department was a good samaritan near Jack's Reef on July 20. Returning to the city from his camp, Cook saw a sedan overturned in a ditch. Two men, one of them Justice of the Peace John D. Kelley of 203 Orchard Road, Solvay, were trapped in the machine and the detective broke the windows in the car to release the occupants. Justice Kelley escaped with a cut hand and his companion was not injured. Detective Cook suffered a minor laceration of one hand in breaking the car windows. Supposedly a fortune awaited anyone who could concoct a commercial use for the chemical waste that the Solvay Process Company dumped into Onondaga Lake and along State Fair Boulevard. Hardly a year passed without a story about someone who was certain he or she were on the brink of success. On July 21 the Syracuse American spotlighted Mrs. June Sherwood of 901 East Genesee Street, Syracuse, who claimed she had used the waste for several inventions — a soap to remove grease and paint from hands; a cleaner for nickel and windows; nine paints, including five water colors and four oils, and a fireproof paint for roofs. Like many, she also was attempting to manufacture a brick from the waste material. All of this was being developed through experiments in a bedroom in her upstairs apartment. Like others who had made similar claims, Mrs. Sherwood couldn't convincingly back up hers. Even much more qualified people fell short. One man who spoke out often about the Solvay waste problem was Edward N. Trump, a chemist who had been one of the first officers of the Solvay Process. Retired by 1935, Trump was still trying to find a solution. Syracuse newspaper columnist Louis Burrill reported in the American on October 13 that Trump had told the Onondaga Historical Association that the waste could be put to practical use in the manufacture of cement. In the meantime, the waste kept piling up and the problem remained until the plant closed many years later. Three men were scalded by acid, one seriously, in a mysterious explosion at the Solvay Process Company plant shortly before midnight on July 6. Edgar Holdren, 123 South Avenue; Robert Billings, 131 North Midler Avenue, and Walter Kelly, 215 Medford Road, were taken to University Hospital. All were badly burned, with Kelly's injuries considered the most serious. Doctors said the men were expected to recover. One of the year's most eye-catching headlines — because this was 1935, after all — resulted from arrests made March 17 at La Villa, a roadhouse in Cold Springs, just north of Onondaga Lake. The headline: 8 'Gay Boys' Arraigned After Raid. At the time the word "gay" meant "merry" or "lively," though it's possible the eight members of a dancing chorus of men who performed in the "Gay Boy Revue" were homosexuals. But that wasn't the point. Actually, it's difficult to figure out what the point was when the young men faced charges of indecent exposure. The eight protested the arrest, saying there was nothing indecent about their show, in which they impersonated girls, wearing women’s costumes and appearing in makeup. Arraigned with the chorus boys was Miss Fay Norman, manager of "The Gay Boys." According to the Syracuse Journal, the woman could have played Mama Rose in "Gypsy." In the end it was much ado about you-know-what, and the entertainers were released. Robert Andrews, proprietor of La Valla, a Cold Springs Road resort, canceled the Gay Boys Revue and booked Len Fries and His Texas Darlings, featuring Irene Cornell, billed as "a nationally known passion dancer." Halloween had just ended when most of the northeast was shaken by an earthquake centered at the St. Lawrence fault north of Syracuse. A Watertown woman was frightened into a fatal heart attack, the only death reported in the Syracuse Journal of November 1, though several people suffered bumps, bruises and minor injuries when they were shaken from their beds. Tremors were felt as far west as Chicago and as far south as Washington. There was little damage in the Syracuse area, though a large chimney atop a building adjoining the Winchester Hotel downtown topped over and rained bricks through a hotel skylight on the second floor. A railroad worker from Buffalo was asleep in a room facing the court where most of the bricks landed and he was showered with debris. A. D. Van Antwerp, a farmer on Buckley Road, north of the city, reported that his 150 chickens panicked so much when their roosts were shaken that they crashed through windows of the coop and escaped to the yard. And while Central New York isn't known for earthquakes, this was the third since March 1, 1925, when considerable damage was caused in Syracuse and surrounding area. Joseph Armani Jr., 28-months old son of Mr. and Mrs. Joseph Armani of 501 Abell Avenue, Solvay, died November 6 of pneumonia in University Hospital where he had been a patient for several days. Besides his parents, the boy was survived by a sister, Dolores. Henry Capella, 36, 204 William Street, Solvay, died on injuries suffered November 6 in an automobile accident on East Genesee Street near Fayetteville. Injured in the accident were Frank Capella, 34, 204 William Street, Solvay; Gus Capella, 33, 103 Woods road, Solvay, and Morris Maestri, 30. 221 Freeman Avenue, Solvay. The four men were in a coupe owned and driven by Frank Capella. It struck a parked car owned by a mechanic who'd been called to repair a moving van that had broken down. Edward J. Colelli, 6, son of Mr and Mrs. Angelo Colelli of 411 First Street, Solvay, drowned June 18 in the abandoned Erie Canal near the Pass & Seymour plant. The boy decided to take a dip in the canal before he returned to Boyd School, where he was a pupil. Besides his parents, Edward is survived by two sisters, Mary and Jeanne Colelli, and two brothers, Joseph and Lawrence. Anthony Dalfonso, 11, of 104 Hazard Street, Solvay died of internal injuries suffered when he was crushed under the wheels of a heavy truck in Center Street, Solvay, at noon on March 25. The boy, a son of Mr. and Mrs. Alexander Dalfonso, was with playmates walking along the curbing when he fell under the wheels of an American Railway Express truck driven by Merrill Nichols, 228 Merriman Avenue, according to Solvay police reports. Surviving the victim besides his parents are three brothers, Daniel, Frank and Dominick Dalfonso, and three sisters, Mrs. Mack Cichetti, Mrs. Manuel Cela and Miss Theresa Dalfonso, all of Solvay. Anthony was a pupil in the sixth grade of Boyd School. Peritonitis, developing from a ruptured appendix, proved fatal to Mary Del Favero, 14, daughter of Mr. and Mrs. Giovanni Del Favero, 433 Chemung Street, July 1 at Crouse-Irving Hospital. She was a first year pupil at Solvay High School. Besides her parents, the girl is survived by four sisters, Louise, Clara, Diella and Ottilia Del Favero, and three brothers, Roy, William and John Del Favero. Mrs. Anne E. Hunt, wife of Harry J. Hunt, chief of the Solvay police department, died August 22. Services took place privately from the home, 801 Woods Road, Solvay, with Rev. Joseph R. Clair, rector of St. Mark’s Episcopal Church, officiating. Bearers were six Solvay police officers — Thomas Brock, Edward Kurtz, Basil Valetta, William Major, Clude Salisbury and John Murphy. Despite constant administration of oxygen in a specially constructed “tent,” little Eola Largo, 7-year-old daughter of Mr. and Mrs. Frank Largo, 2077 Milton Avenue, Solvay, died November 16 at Crouse-Irving Hospital, after a three-day illness from bronchial pneumonia. Frank A. Maestri, 67, a native of the Tyrol and a restaurant proprietor in Solvay for many years since coming to the United States 48 years ago, died December 6 at his home, 104 Caroline Avenue, Solvay. Survivors: His wife, Mrs. Barbara Maestri; two daughters, Mrs. Paul Evertz and Mrs. Alphonse Squiliacioti; two sons, Frank and Harry Maestri; five grandchildren, and a sister, Mrs. Katherine Galante. Mrs. Julia Balamut Markowicz, 37, a teacher at Solvay Intermediate School, died December 19 at her home, 306 Hamilton Street, Syracuse, after an illness of several months. She was a graduate of City Normal School and Syracuse University. Survivors: Her husband, John Markowicz; her parents, Mr. and Mrs. Lucas Balamut; a sister, Mrs. Stanley Pobutkiewicz, and two brothers, Ignatius and Henry Balamut. Katherine A. Muldoon, seven-year-old daughter of Mr. and Mrs. William F. Muldoon of 206 Charles Avenue, Solvay, died December 26 in Syracuse Memorial Hospital of appendicitis. Besides her parents, she was survived by a brother, William F. Muldoon, Jr.
Peter Tarolli, 57, well-known Solvay resident for 40 years, died at his home, 910 Second Street, September 27.He was engaged in the real estate and insurance business in Solvay. A communicant of the West Solvay Christian Assembly Church, of which he was an elder since its founding in 1917, he was active in the work of the church. Surviving are his wife, Mrs. Johanna Tarolli; three sons, Leon, Peter A. and James W. Tarolli; two daughters, Lydia L. and Adeline M. Tarolli; a brother, Frank Tarolli of Lakeland, and a sister, Mrs. Joseph Pizzini of Tyrol. William Tindall, veteran Solvay Process Company employee, died September 17, at the home of his son, Joseph Tindall, 3931 Milton Avenue, Solvay. For many years he served as foreman of the carpenter shop of the Solvay company. Survivors: His wife, Mrs. Isabella Payne Tindall; two sons, Joseph F. and J. William Tindall; three sisters, Mrs. William t. Rood, Mrs. P. Fred Tickner and Mrs. Charles P. Williams, and a brother, Charles R. Tindall. Joseph Umbaca, 19, of Belle Isle, a meat cutter employed at Ruva’s Market, 104 West Laurel Street, Syracuse, was killed March 24 in an automobile accident near Elbridge. He was a passenger in a car driven by Joseph Ruva, 21, a Syracuse University pre-medical student who lives at the West Laurel Street address. Ruva told police Umbaca grabbed his arm and asked him to stop the car and the vehicle went out of control, drove off the road and smashed into a tree. Police found no evidence to hold the driver responsible for the accident. Ruva’s father owns the meat market. Solvay's hockey team, which had been undefeated for two years, was upset by Baldwinsville, 2-0, and eliminated from the county league playoffs. The Bearcats went on to win the consolation game, 4-2, over Fayetteville. Stasko scored two goals, Tarolli and Galante one apiece. Oldtimers will recall when Split Rock had its own high school. It was small, but often a surprising force in scholastic sports. So it was this year as Split Rock, on March 26, eliminated Solvay from the county league basketball playoffs, 41-36, in overtime. Carman Pirro paced Solvay with 18 points; Ferrante added 9, Renders 7. Split Rock had three players in double figures — Evans (12), Harkola (11) and Rubel (10). Solvay got off to a rough start in the 1935-36 season by again losing to Split Rock, 26-21, and then dropping its next two games to Marcellus and Baldwinsville. Again, you'd have to be an oldtimer to remember what a rare occurrence it was for a Solvay High basketball team to lose two games in a row, much less three. It would be a long, unsuccessful season for the Bearcats. They called it the Journal-American marathon, but the April 5 race was about 10 miles shorter — 16 miles, to be exact. Entered were two Solvay High School representatives, J. Tearney and Jim Bethka. Representing the Solvay Aces were E. D. Kazel and H. B. Howell. Bethka ran the best race, finishing in eighth place. Bethka also was included in an ambitious effort by Solvay High to compete in the scholastic division of the annual Penn Relays in Philadelphia on April 26. Joining Bethka in Philadelphia were track teammates Charles Rowe, Bruno Mancabelli and Floyd Taglaferri, but they failed to qualify for the finals of the medley relay event. A total of 62 high schools were entered. Six weeks later the Solvay track team won the county league championship. The Asbury M. E. Church baseball team won the YMCA Church League title in 1934, so they decided to make a grand entrance at Liverpool's Griffin Stadium when the 1935 season began. With recently elected Solvay mayor John Degan in the lead automobile and accompanied by several ministers, the team traveled from the church to Liverpool parade-style. Solvay High's baseball team made it to the championship game in the county league, but lost to Liverpool. Andy Piraino, uncle of future Syracuse bowling legend, Marty Piraino, took over in September as manager of the Hilltop Recreation Alleys in West Solvay. The establishment was formerly known as Korzyp's Alleys. Andy Piraino was a great bowler in his own right, as were other members of his family. On November 5 the Solvay High football team won the Onondaga County League championship by defeating Marcellus, 20-0. Solvay was undefeated and unscored upon, winning five games and playing a scoreless tie against Baldwinsville. Until meeting Solvay, Marcellus had surrendered only six points all season. The Solvay team featured the Pirro brothers, Rocky and Carman, and Joe Brostek. The trio would later star on the Catholic University team. A rugged, 185-pound product of Solvay High School is one of the chief factors in the success of Coach Arthur Horrocks’ undefeated Syracuse University soccer team. He is Guido Semino, sophomore center forward. Guido, student of Italian extraction in the engineering college on the Hill, has tallied 11 goals in four games. He scored to goals in Syracuse’s 5-2 win over Buffalo, two more in a 3-2 win over West Chester Teachers of Pennsylvania, ending a 44-game winning streak, two more goals in a 6-1 win over Lehigh and an incredible five goals in the 7-1 victory over Colgate. Do we have to wear these uniforms? 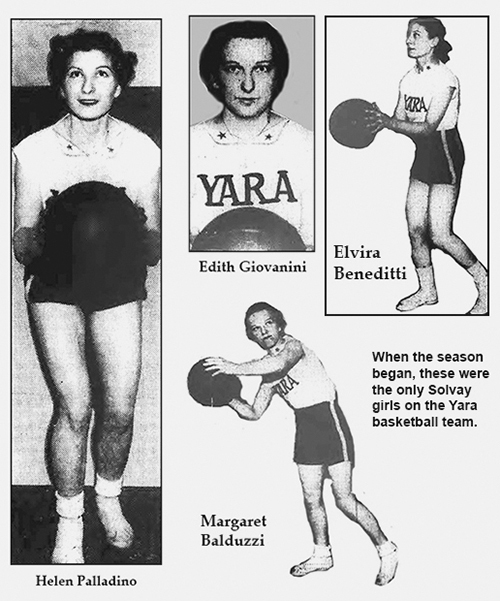 On November 5 the Syracuse Journal announced that the village of Solvay was to represented in the Journal-American Girls’ Basketball League during the 1935-36 season. The newspaper said, "The team will be built around Helen Palladino, member of the Staten Island pro team last year. Miss Palladino was high scorer in 14 of the 23 games played by her team last year." Other members of the Solvay team, according to the Journal, were Margaret Balduzzi, Margaret Duda, Wilma McLaughlin, Francelia Metcalfe and Pia Chemotti, who three years earlier were teammates of Helen Palladino at Solvay High School, going undefeated and winning the county title. Later came news this team would be sponsored by the Bendixen Tobacco Company, and that the uniforms would be more or less a billboard for a company product through the words Chew Yara. Still later came the realization the team would be called simply Yara, after the chewing tobacco, without the word, "Chew." However, the Solvay connection pretty much disappeared, as did four of the players originally listed. Two other Solvay graduates, Edith Giovanini and Elvira Beneditt joined Helen Palladino and Margaret Balduzzi, who teamed up with three Fayetteville woman, Harriet Sebring, Helen Ray and Doris Goodfellow, and the two Fatcheric sisters, Helen and Julia, from Warners. The team started its season well and finished in a three-way tie for first place, but was eliminated in the first round of the playoffs.